In Arizona, disclosed dual agency is a practice allowed by law wherein one agent or broker provides services to both buyers and sellers in the same real estate transaction. According to the National Association of Realtor’s Code of Ethics and Standards of Practice, “Realtors® may represent the seller/landlord and buyer/tenant in the same transaction only after full disclosure to and with informed consent of both parties.” But just because dual agency is legal, doesn’t mean it’s in the best interests of all parties in a Scottsdale luxury real estate transaction. In fact, it’s been demonstrated in countless court cases within Arizona and throughout the country to be a glaring conflict of interest. Exclusive Arizona Buyers Agents eliminates this risk by providing elite service to only Arizona luxury real estate buyers that protects their interests. Real estate/broker loyalties can be split, which makes it a significant challenge to establish a transparent, loyal relationship fully benefiting the Scottsdale luxury real estate buyer. Whether it’s single broker representation (two agents under same broker represent buyer and seller) or single agent dual agency representation (when one agent represents both the buyer and seller), it all boils down to one entity receiving both commissions while providing limited service. Arizona luxury home buyers place themselves at financial and legal risk when there is a less-than-clear understanding of the relationship they need, or have, with agents. For buyers of Scottsdale luxury real estate looking to find their dream home, negotiate the best commission rate and home price, receive the highest levels of personalized service and protect their legal rights, it is critical to understand the form of representation a broker or agent is providing, and what representation is in their best—and worst—interests. 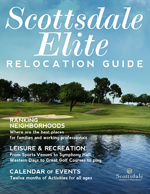 There are too many critical nuances in Arizona luxury real estate – nuances that a Scottsdale exclusive buyer’s agent knows best. (See “Is the home buying process different for luxury real estate?”) It takes a fully licensed, credentialed Realtor® who also is a specialist in gated luxury home real estate to understand the intricacies of the Scottsdale luxury real estate market for those both in state and out of state – thereby giving the Scottsdale luxury home buyer the distinct advantage.